Back story: We bought the 2653 about 4 yrs. ago for $3000, put another $2,000 in her - 4 tires, new carpet, appliance maintenance, stuff like that. The previous owner neglected to do any roof maintenance so there was considerable damage to rafters (left front) and rafters and wall studs on the right rear. I inspected these areas and resealed all the roof's edges and joints with Dicor sealer. Three years passed and all was well. Now the right rear is showing signs of leaking again. I have a good, honest RV dealer, and I store my trailer on his lot. I explained my situation to the service manager and asked him to see if the roof could be "fixed." (as opposed to "repaired.") They pulled the trailer in and declared the roof to be "unfixable." I was a mechanic and I know that means THEY don't want to try to fix it because they don't think they can stand behind a patch job. I don't blame them. Because of the roof's condition, he suspects there could be small cracks and pinholes all over the surface. So ... here's the question (finally, I told you this was a long post, didn't I? ): What can I do to halt the ingress of water? Procedures? Products? Anyone? Not knowing the exect damage, have you resealed the roof? Teach, I'd see about a second opinion on repairs. Hope there is someone close that can help you. It's unlikely that the membrane, as a whole, has deteriorated to the point that it is "unfixable". Even with no maintenance, the membrane itself should last a long time (though without cleaning, it might not look pretty). The seams around the edges and near vents, etc are a different story. Here, I'd look to do an eternabond seal around all these edges. This will make your roof water tight, so long as the membrane is OK. This would be a relatively inexpensive fix that might buy you a few years till the water damage (from before) really starts to take its toll. 2012 Chevrolet Silverado 3500HD D/A DRW, Classy Chassis Conversion, aka "Garage Queen II"
Sorry to hear about your roof. I am not disputing your dealers choice of wording, however anything in these campers is fixable. The cost is another matter. This may also be a semantics on words. Can they fix what you have there to be good as new or anywhere near good? Odds are high, no. They can replace it though and make it a long term repair. If the water and wet is in the roof area, the insulation is a mop that will not ring dry. The rafters can be in trouble and the walls too. It is however fixable meaning rip out the old and put new in. The issue comes to be the amount of labor at standard shop rates. In this case the repair can cost more than you paid for it. If someone has time and is handy with wood working, it is all rebuildable back to new. The materials are not that bad, but you are working a lot of hours of love…. Now to help your camper from getting worse. The decay up in the ceiling will not stop until it is opened up, remove the wet wood and dry it out. From what I know, 1 to 2 years of being very wet will totally separate any glue that was left bonding anything together. You may be approaching this or past it. Anything that was glued will start separating and there is not much strength left. OSB board is the worst but luan falls in here too. The rafters have luan side plates. I have seen what a brand new camper can turn into in 2 years from water wicking in the side seams when not sealed right. The damage is shocking. If you want to stop the water from still entering, a trap over the top and part way down the side will quickly stop it to buy you some time on what to do next. Not being able to see the roof I do no know about all the open space of the rubber membrane. Is it worn black or is it still all white? If it is still all white then that is a good sign as the top layer may still be intact. When the black starts showing up the rubber has worn thin and then it may be more susceptible to leak through. If you are at the black rubber stage they do make rubber roof coatings to extend the membrane. The bad news is the bud board under the rubber can wick water long distances. If it is wet now the rubber may be totally separated from the bud board you may not have much choice as then as there is no strength left to support the rubber membrane lying over the rafters even if it is not worn thin. The side seams or any seams around roof vents etc can be the biggest enemy. The screws holding the drip rail on may be rusted out and water wicking in through them under the vinyl cover. The caulk itself up top you can see and if it is cracked, it can be scraped out and fresh put in. You can also get a feel for how much rot is in the top wall sill plate by unscrewing the drip rail screws. If they come out as total goo from wet wood it can help tell how bad the situation is. You can eternabond over the screwed area, it will however seal the water in. You have to totally clean the area for the eternabond to stick. The caulk and eternabond can stop new water from coming in however the rot will keep on going. Caution about doing any kind of standing on the roof even on plywood out over the top. If the rafters are compromised they may give way. Working from the side on a ladder would be better until you know the extent of the damage to the rafters. These 2 posts may help. This 1st one is how I eternabonded all the side seams. I also got rid of the vinyl strip and replaced every screw before I eternabonded over them. I had 1 screw that was close to the goo stage. I was lucky I just caught this. The wood was still firm and I dicor pumped it big time before putting a new screw in that did bite into good wood. 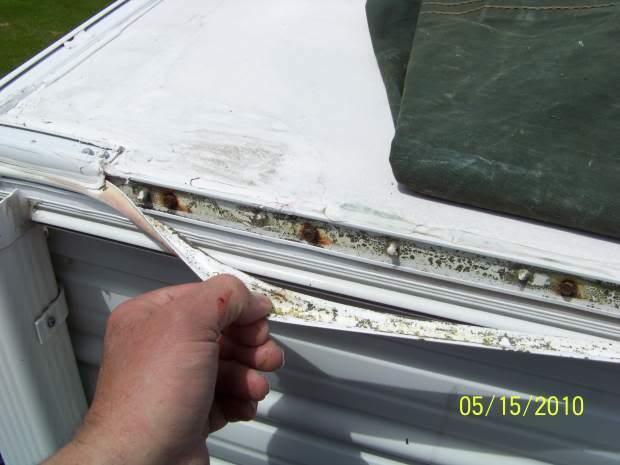 There is also a pic of my buddies camper 2 year old were they did not seal the drip rail right. That is 2 years of damage. Good luck and let us know if we can help more. I really can't add anything useful to what everyone else has said. These repairs can all be done pretty cheap if you do the work yourself and have the ability to do so. But you take it to a dealer, and depending on the extent of the damage, the bill will add up quickly. It isn't glorious work either- probably lots of mold/mildew, rotted/disintegrating wood, a gooey mess with the old roof sealant and putty tape, etc. In the mean time, making sure all the roof edge seams and the seams around each roof component are all in tact (not loose or cracked) and fixing any that are will help prevent it from getting any worse. After talking to JohnB and Gary about a trailer this past weekend, they said the key is to find an independent RV repair guy. The job will require many hours of work, so finding a dealer or independent person who can do it at around $75-$85 an hour is much better than over $100. Here, I'd look to do an eternabond seal around all these edges. This will make your roof water tight, so long as the membrane is OK. This would be a relatively inexpensive fix that might buy you a few years till the water damage (from before) really starts to take its toll. Eternabond? That's what I wanted to know. What sealant to use that wouldn't destroy the EPDM. If I were keeping the trailer, I would contact Gary's friend and leave her to be stripped, repaired, etc. Penny doesn't want to keep the trailer, so a temporary patch job is the only option. I've used that before, when I first got the trailer, to seal the edges. Should I re-apply Dicor to stop the edge leak? Jim, yes that is the sealent. Heads up as they make a few types, the color can change, the W in the part number means white. They also have self leveling and non leveling. On the roof, you want self leveling. It's amazing, it flows and blends before your eyes. The no leveling is good for vertical surface on the side of the camper or other areas where you do not want the self leveling feature. Here is the Dicro site with the types. Click the specs tab for the part numbers. The 501 is better if your can find it. It makes a wider bead. Sunline sent me some one time. The 502 is what I could buy in RV stores, it makes a narrower bead. Both the same sealant, just different flow characteristics. The 502 you may have to make 2 passes verses 1 pass with the 501. The TT makers like the 501 as they are in a hurry and pumping lots of it out on bare seams. The 502 is more for patch repairs. Yes you can put more down. If you cannot see a crack, split or separation in the caulk then it is OK. No need to spend and apply lots of caulk to areas that are fine. When I mean a crack or split, these can be very big, 1/16”, 1/8” wide or bigger. Or they can be real fine in the early stages. More like a slit, 1/32” long and maybe only a hair line wide. (paper or match book cover width) This is how they start, real fine. Then they grow with expansion and contraction. Very bad up north where the snow flies and water gets in and freezes ripping it open all that much quicker. The way to stay ahead this these it to seal them up when they are real fine so they do not grow. By the time that are 1/32" to 1/16" or larger thay can be deep enough to allow a leak to occur. Odds are high under your vinyl strip may be a leak source. Pull the cover off and look. If it looks like this and rusted screws, that can be a path of water intrusion. Water wicks in the rusted screws or and the screws being gone or screwed into goo inside will not allow the screw to keep the gutter rail tight on the butyl sealing tape. Water comes right in as the gutter can be under water during a rain storm. Caulking the top will not stop this area. Pull the screws, if there is anything left in the wood, put new ones in. Longer ones sometimes can bit into new wood. Then seal up the screw heads. Eternabond is one way. If you are going the Ebond route, ideal is to counter sink the screw heads. Change to flat head screws. It will work over the hex heads and in this case it may not matter as sooner or late this will all come off.